The announcement that the Dawn spacecraft is running out of its hydrazine fuel was not unexpected, but when we prepare to lose communications with a trailblazing craft, the moment is always tinged with a bit of melancholy. Even so, the accomplishments of this mission in its 11 years of data gathering are phenomenal. They also speak to the virtues of extended missions, which in this case gave us views and a wealth of information about Vesta but also a continuation of its stunning orbital operations around Ceres. And at Ceres it will stay, a silent orbiting monument to deep space exploration. Image: This artist’s rendering shows NASA’s Dawn spacecraft maneuvering above Ceres with its ion propulsion system. Dawn arrived into orbit at Ceres on March 6, 2015, and continues to collect data about the mysterious and fascinating world. The mission celebrated its ninth launch anniversary on September 27, 2016. Credit: NASA/JPL-Caltech/UCLA/MPS/DLR/IDA. Speaking of Marc Rayman, he deserves great thanks for his efforts at keeping an ongoing chronicle of Dawn operations available in his Dawn Journal. In his latest entry, Rayman notes how he always had to write these entries in haste because of his full schedule, but it’s the mark of a gifted narrator that haste is never an impression the reader comes away with. He has always seemed to be a patient and thorough writer who took the time to get things right. We also took a short look at the long-term fate of the spacecraft. To ensure the integrity of possible future exploration that may focus on the chemistry related to life, planetary protection protocols dictate that Dawn not contact Ceres for at least 20 years. Despite being in an orbit that regularly dips so low, the spaceship will continue to revolve around its gravitational master for at least that long and, with very high confidence, for more than 50 years. The terrestrial materials that compose the probe will not contaminate the alien world before another Earth ship could arrive. So we have a window of about 50 years and perhaps more before Dawn will come down on Ceres, and Rayman’s inference here is that this gives time to mount another mission to Ceres before any contamination could occur. But given that it has also been 50 years since Apollo, I for one don’t necessarily see this as a very large window, and can only hope that its presence will be a motivator for a return to the dwarf planet before we have to wonder whether what we find there could have been affected by anything from Earth. Dawn is the only spacecraft to orbit a body in the asteroid belt, and it is also the only spacecraft to orbit two extraterrestrial destinations, a feat that was accomplished thanks to its ion propulsion system. Dawn reached the 4.5 billion year old Vesta in 2011 and spent 14 months orbiting it, showing us a mountain at the center of the Rheasilvia basin that turns out to be twice the height of Mt. Everest, along with multiple canyons that fit into Grand Canyon scale. We also learned that Vesta, with its violent history, was the source of a common family of meteorites. Ceres turned out to be even more of a surprise, with its bright salty deposits made up of sodium carbonate in the form of a slushy brine that originated from below the crust. Some regions on Ceres were geologically active in comparatively recent times, indicating a deep reservoir of liquid. Organic molecules turned up in the area around Ernutet Crater, but we lack the instrumentation aboard the spacecraft to be able to say whether they were formed by any biological processes. “There is growing evidence that the organics in Ernutet came from Ceres’ interior, in which case they could have existed for some time in the early interior ocean,” said Julie Castillo-Rogez, Dawn’s project scientist and deputy principal investigator at JPL. With its high-resolution images, gamma ray and neutron spectra, infrared spectra, and gravity data, Dawn has delivered full value and continues, as this JPL news release reminds us, to “swoop over Ceres about 22 miles (35 kilometers) from its surface — only about three times the altitude of a passenger jet.” For his part, Marc Rayman thinks about Dawn after it goes silent as “an inert, celestial monument to human creativity and ingenuity,” which it is. But the data Dawn gathered still lives, and will resonate in the form of discoveries and new papers for decades. I doubt that. I think it will wind up at The National Air and Space Museum of the Smithsonian Institution. Or perhaps at JPL in Pasadena, California Republic? The Ceres branch of the museum, most likely. This image of Cerealia Facula is just stunning. Recall how the early images just showed bright spots on Ceres and there was so much speculation on what they were. I hope that at some point we get a lander to analyze the surface of Ceres to compare with the results we will have from smaller asteroids. Will Ceres become the water, chemical rocket fuel, nuclear rocket propellant, and fuel cell source for the inner solar system? I would have liked to see Dawns orbit raised slightly in order to delay the potential contamination event. Very surprised that 20 years was seen as sufficient by NASA officials. Sounds like the era of rigid planetary protection protocol may be ending for bodies where a near to midterm potential for human settlement exists. NASA said 50 years, not 20. The protocol dictated as I said only 20 years. Confirmed by Dawn Mission Director Dr. Marc Rayman. The 50 years estimate comes from the mission team following their calculations of Dawns orbital decay rate. Ceres would likely be the prime target for asteroid mining for volatiles, but there is so much material in NEO locations for other elements odds are we won’t get there til after we reach Mars anyways. Ceres is further away, so has a bigger dV demand. I suspect trip times are much longer and trip windows much less frequent. It’s already bad enough at Mars, with 6 months every 2 years. That would be a bigger factor than delta-v, especially if we do on orbit and in situ refueling, which I think we must, both. With a mean distance of 414 million km (257 million miles) I think Ceres is always going to be secondary to Mars epsilon. Or am I just Mars centric? I realize the gravity well is far deeper but we already have ideas as to how to get down with manned vehicles. If we land near subsurface water we may be able to find life. I’m not sure the same can be said of Ceres. PROPOSED MISSION: A polar orbiter with MARSIS-like radar and a lander with a deep drill bore and a sample return capsule. I am so certain lakes like the putative one on Mars(oh, by the way, the AVERAGE surface temperature of Ceres is the same as the surface temperature of the south pole of Mars in the SUMMER, due to Ceres’ much lower albedo)exist on Ceres, and are much more accessible than the possible one on Mars, that you would need a lander that is storable for a couple of years. The best bet for liquid water near the surface: Somewhere on the summit of Ahuna Mons, which I sincerely hope Dawn can image(if it has not done so already)with the SAME RESOLUTION as it did for Cerealia Facula. Hopefully, missions like this may someday be routinely done by university research groups as the technology becomes very robust and cheap in a few decades and the space based infrastructure expands. Apart from the gravity well problem on Mars to ship water from the surface to orbit, there is the issue of just plain mining to depth on Mars. On Ceres, that really isn’t an issue, as operations can more easily strip mine Ceres water to a huge depth. Whilst the delta-V is higher from Ceres to the inner system, the low gravity well allows low thrust, high Isp or sail ships to move the water cheaply. With a supply line, rather like oil tankers on Earth, the time issue for delivery will not be important. If humans colonize Mars, they may not want large mining operations spoiling it. I doubt Ceres will be so precious. High water content allowing easy extraction with vast reserves. Very low gravity allowing mining to easily move water from the surface to the inner system using cheap transport. Not an attractive colonization target allowing large-scale operations. Even if passenger-carrying space elevators are never developed for leaving the Earth (due to the very high strength requirements for terrestrial ones), asteroid-based "freight elevators" (which even nylon rope is sufficiently strong for in some cases; Kevlar and Spectra fibers would suffice for lunar and Martian elevators, although airless worlds don't present wind vibration and dust erosion problems for elevators) would enable the industrial development and settlement of the Solar System. If utilized in concert with solar sail ships (which even work well enough out to Saturn; Earth- or Moon-based laser propulsion could take over from there), the Solar System could be mined, colonized, and commercially served without using rockets at all, except possibly for the first 200 or so miles to low Earth orbit (and to the Moon, although jet aircraft/orbiting rotating tether systems would also enable fast lunar trips, and even Earth-to-orbit flights). On small, airless bodies you do not have to rely on the asteroid’s own rotation. You can just rotate the ‘elevator’ from a hub, using an electric motor. Such a ‘sling’ can go much faster and be much shorter than an elevator, and there needs to be no climbing, either, as the centrifugal force will take care of the lifting. Ceres is an excellent target for a Curiosity type rover. Lets start mass producing them and stock up on Plutonium and also figure out a landing sequence that does not involve parachutes, for air less worlds. With the advent of the BFR from SpaceX I can imagine mass producing and launching dozens or hundreds of Curiosity rovers, Kepler 2.0 and WISE telescopes with greater scientific capabilities, as well as a large number of DAWN 2.0 probes to explore the rest of the asteroid belt. I’m no rocket scientist, so correct me if I am wrong, here. I believe that the Skycrane has enough thrust in and of itself to LAND a Curiosity-mass lander on the surface of Ceres, due to its very low gravity as long as the initial approach is not too fast. The Skycrane was released at 1.8 km above the Martian surface and travelling at 100 m/s. Given the masses of the crane and Curiosity, it should be easy to calculate the maximum velocity for the crane to deliver a Curiosity class rover to a soft landing on Ceres. My guess is that it should be possible unless there is some other unaccounted for factor that prevents this. I remember when the mission started and how amazing its initial findings and photos were, the bright spots so unexpected and full of mystery.Truly an astonishing achievement of space exploration, hopefully with more to follow. Also just a reminder that China was contemplating a Ceres lander and rover not so long ago. With the maturation of cubesats there is no reason to believe we won’t be able to send another probe, or even several, to Ceres within the next 50 years, possibly within 20 years. I don’t think the NASA timeline is unreasonable. So is someone planning on “rescuing” Dawn before it does crash into Ceres? Or might they push it into a solar orbit where the venerable space probe will not hit any celestial bodies for millions of years? Because if there are terrestrial microbes living (and presumably reproducing) on Dawn right now, I wonder if waiting 20 years will be enough? By the way, Mariner 9, which has been orbiting Mars since late 1971, is supposed to crash on the Red Planet in 2022 as another deliberate attempt to avoid contaminating our celestial neighbor. It would be a shame to lose such a historic space vessel. Too bad a couple of CubeSats couldn’t be sent to place Mariner 9 either in a much higher orbit or gently on Phobos or Deimos until humans can arrive and build a proper museum there to display it. Let us not forget there are plenty of other active and defunct probes still orbiting Mars for now. What shall be done about them? And how about all those landers? For example, Mars 3 lies intact on the planet’s surface since 1971. How stringent were the Soviets about sterilizing their robot explorer? Older, less stringently decontaminated probes on Mars might be a good target for experiments on contamination. They have had plenty of time to contaminate the surface, so it might well be possible to determine whether and how much much that has occurred. This might get us past the extreme fear of contamination on one side, and the hand waving the problem away on the other. Interesting. Didn’t know Mariner 9 was still orbiting. Can this be confirmed? In any case, should a significant move to occupy and or monetize the inner solar system occur, today’s planetary protection protocol will come crashing down just as surely as the venerable Mariner 9. I distinctly recall reading that 50 years in Mars orbit was chosen by NASA to ensure no terrestrial organic contamination from the probe. Viking 1 and 2 orbiters were probably under an even more stringent decontamination process. But what about the rest? NASA was even worried about Zond 2 back in 1965 which supposedly missed the planet by a few hundred miles, but they were still concerned about both the margin or error and just how well the Soviets cleaned their probe. As an aside, decontaminating the early Ranger lunar probes may have been their undoing, especially Ranger 3, 4, and 5, all of which failed to deliver their balsa-wood encased seismgraphs to the lunar surface. Well, okay, Ranger 4 did – but in non-working order. At least it was the first American probe to “land” on the Moon. NASA’s Mars rover Opportunity has been out of contact with the Earth for nearly three months, and the agency announced plans last week to try to restore contact with it. Jeff Foust reports that the overall Mars exploration program at NASA is facing challenges as well. ArXiv 1805.04115. “The Reclassification of Asteroids from Planets to Non-Planets.” by Phillip T. Metzger, Mark V. Sykes, Alan Stern, Kirby Runyon. Does this mean that Ceres is a PLANET!? Caveat: Alan Stern is pushing HARD to reclassify Pluto as a planet, so there may be some BIAS here. Why can’t we have multiple categories of what constitutes a planet? As we have seen from over two decades of studying exoworlds, there are plenty of celestial bodies out there which do not match anything found in our Sol system – and we have just scratched that surface. And what about moons? If Titan, Europa, and Ganymede were circling Sol instead of their parent worlds, they would have been long categorized as actual planets. Pluto and Ceres belong in their own categories, now that we know so much about them. Adjust the labels as our knowledge grows. I would like to see the surface exploration of Ceres given a high priority. 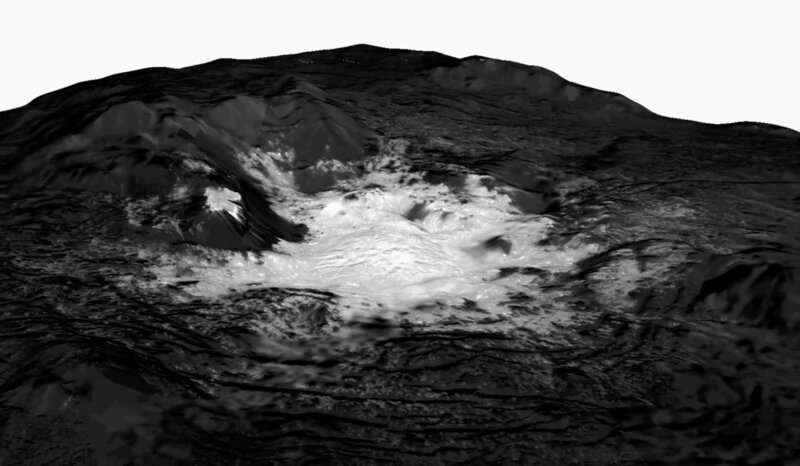 Ceres is though to be a body that originated in the outer solar system and over the eons lost its icecap, so its surface is somewhat akin to the bottom of the ocean on Io. Probes into Io’s ocean are going to be expensive, so the need to have their instrument suite as focused as possible to maximize their return. Preliminary investigation of Ceres surface would help give us an idea of what to expect, particularly with respect to organics. As an example of going in without sufficient preliminary work, I’m thinking of the Viking landers, which produced ambiguous results at great cost. The history of Mars is much more compelling as a target for first non Terran life form discovery than Ceres in my mind. Mining is separate question of course. I was surprised by the surface temperatures on Ceres quoted by Harry Ray but surely the fact that it has become increasingly clear that Mars had large bodies of surface water on a planet sized body in the past argues for the possibility of remnant life (or even abundant microbial life) below the surface today. I would love to explore both bodies thoroughly but my money for manned exploration would go to Mars. Ceres sounds perfect for robotic explorers of increasing capability.